Questions of authorship, ownership, labour, and politics shall be raised in relation to architecture. The role of an architect today might be performed as the role of an investor, who does research on material in a changing society. That leads to the question, how architectural projects could differentiate between structures of society or economy and structures of everyday life? How could research projects in this field formulate practical propositions? 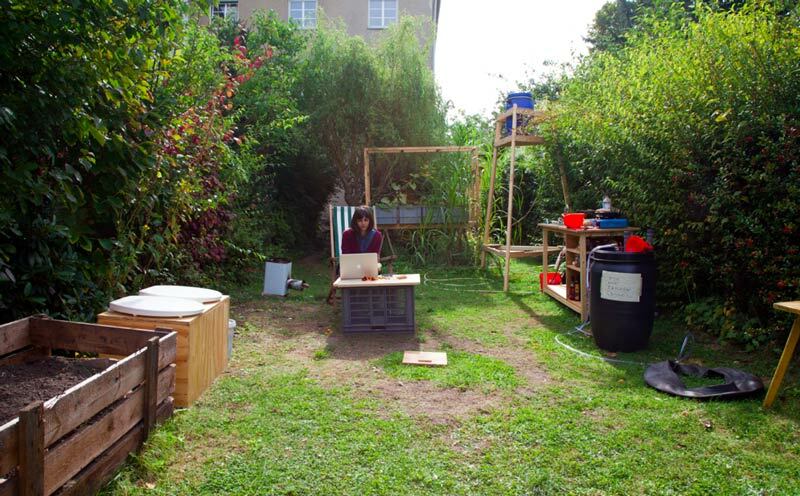 Presentations will include: A self-sufficient homestead in Berlin Marzahn produced by collective intelligence and labour, and run by an elementary economic system of exchange; a House for Doing Nothing where withdrawal is the only true political action; design theory addressing the post-neoliberal city; and a discussion on how conditions of scarcity might affect the creativity of the different actors involved in the production of architecture and urban design. The Graduiertenschule is supported by the Einstein Stiftung Berlin. Valentina Karga during the performance "30 days in the garden"